Two Florida lifeguards recently won Season 2 of TV's Beerland with their Man-Go-War Wheat Ale. You can watch the season finale and winner announcement by clicking that link. That win secured a deal with Golden Road Brewery to brew and distribute the beer. 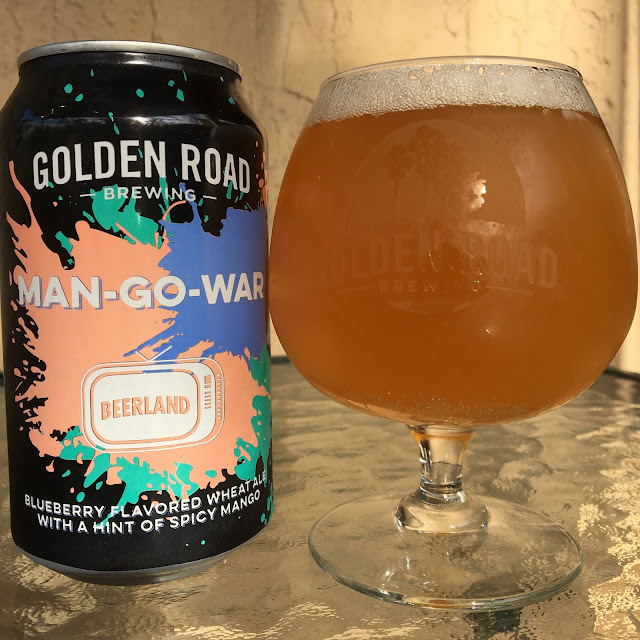 Man-Go-War is a blueberry-flavored wheat ale with mango and some heat. 5.0% alcohol. There is a wheaty twang in the aroma and just a faint hint of blueberries. The flavors, however, show a huge dose of blueberry from the first sip! Nice texture, wheaty twang here as well. Some peppery spiciness builds with a few sips with some mango coming at the finish of each sip. By the end of the glass, I felt like the mango stood out, replacing the initial blueberry rush, an interesting reversal. And there is definitely a spicy, peppery heat that lingers into the finish. Good concept, flavorful. I liked it!